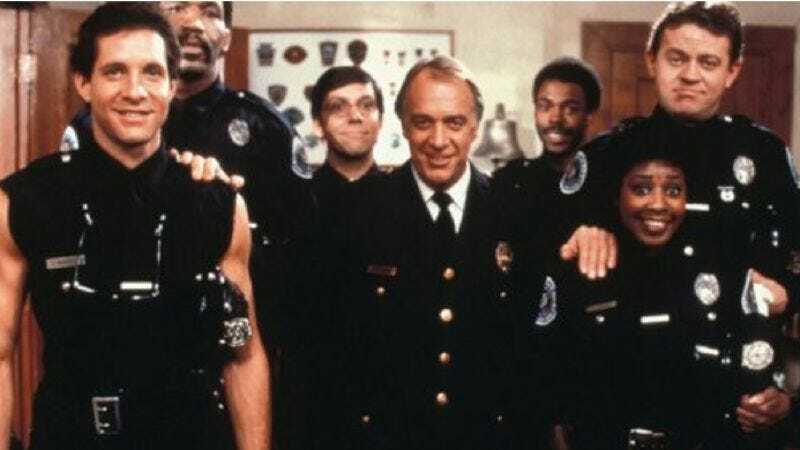 It’s been nearly a year since any forward progress was made on New Line’s remake of Police Academy, suggesting the studio may have quietly scrapped the project out of deference to the memory of Bubba Smith, or to evade Steve Guttenberg’s phone calls. But it turns out New Line has been spending that interim searching for a director who can lend the proper 21st-century edge to capturing all the summer camp shenanigans that go into creating America’s thin, blue, horny line, and Entertainment Weekly reports that it’s finally found him in Scott Zabielski. Zabielski has helmed several seasons of Comedy Central’s Tosh.0, so he’s familiar with both unoriginal, appropriated material and people getting hit in the balls. More importantly, he also serves as a reserve officer in the West Hollywood police force, so he should be able to bring the exacting procedural verisimilitude that audiences demand from the Police Academy movies. As previously reported, Zabielski will be working from a script by David Diamond and David Weissman, whose credits include Old Dogs, When In Rome, and continuing to get steady work despite being the guys who wrote Old Dogs and When In Rome. And as before, there’s been no movement on casting, save for original series producer Paul Maslansky’s avowal in 2010 that he planned to recruit a “new talent and season it with great comedians,” and Steve Guttenberg’s reinvigorated regimen to get into “cutoff shape” again. While a Guttenberg cameo still seems likely, don’t count on seeing Michael “Motor Mouth” Winslow, of course, who long ago retired to his ranch to breed imaginary dogs.